The Master in Global Corporate Compliance (LL.M./MsL) prepares students to respond to the new and complex regulatory challenges in the global marketplace across different industries. From building a new international legal strategy and implementing a new compliance culture, to fighting money laundering and cybercrime, students will undertake a unique journey with a practical case study approach, and build the essential knowledge and skills to assure the reputation and assets of top companies around the world. The program includes an MBA Module, which provides students broad knowledge of the fundamentals of business management and strategy and allows them to earn a Certificate of Business Administration from IE Business School in addition to the LLM/MSL degree. 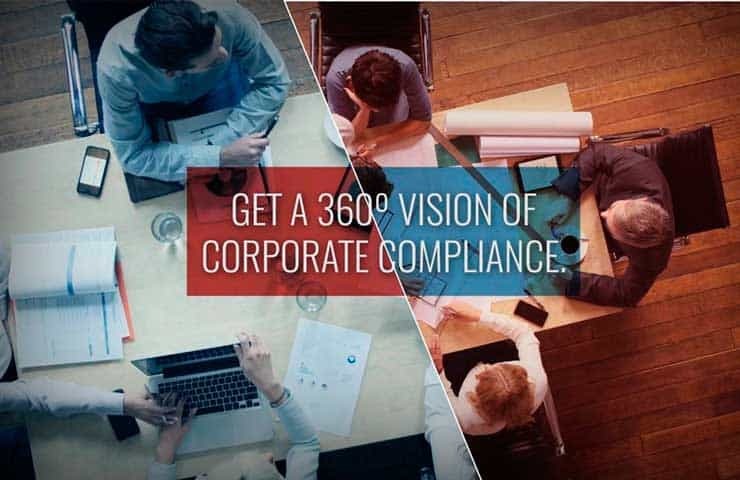 The Master in Global Corporate Compliance prepares students to manage the new and complex regulatory global demands and to implement a compliance-based ethics program. This program is structured to give you the flexibility to learn in the way that best works for you. 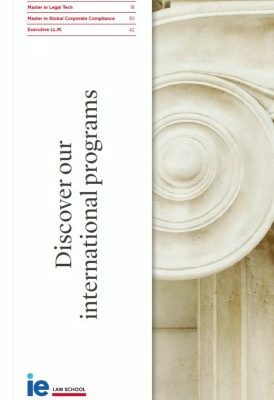 Whether you choose the part-time or the full-time format, you gain the same global content, access to world-class faculty, and will be awarded with the same Master’s degree and the same certificate and one-week academic experience in Global Corporate Compliance in NYU School of Law, regarded as one of the most prestigious and selective law schools in the world. The part-time format, intended for working professionals, combines online classes with face-to-face periods at IE’s campus in Madrid, while the Full-Time format requires 10 months of fulltime study in Madrid. During the program students will gain knowledge of the key areas involved in the role of a Compliance Professional, contributing to the transition of the compliance profession to the international stage and across various industries. In addition to its modern curriculum, highlights of the program include a practical teaching methodology based on case methods, role-playing, class simulations, and debates, all of which shape students into the professionals required by today's market. The program is structured to be a perfect combination of compliance disciplines and business skills required in a corporate environment while applying the most sophisticated IT compliance solutions. 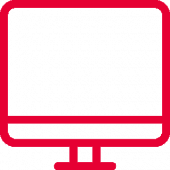 Students will attend Compliance Live Seminars, a series of interactive sessions on Compliance hot topics given by the most varied and renowned professionals in the field. Students will team up to solve a complex practical case that will test all the tools learnt throughout the program. One or several students from the winning team will be granted an internship to work on the compliance department of Eversheds Sutherland Nicea Madrid office. 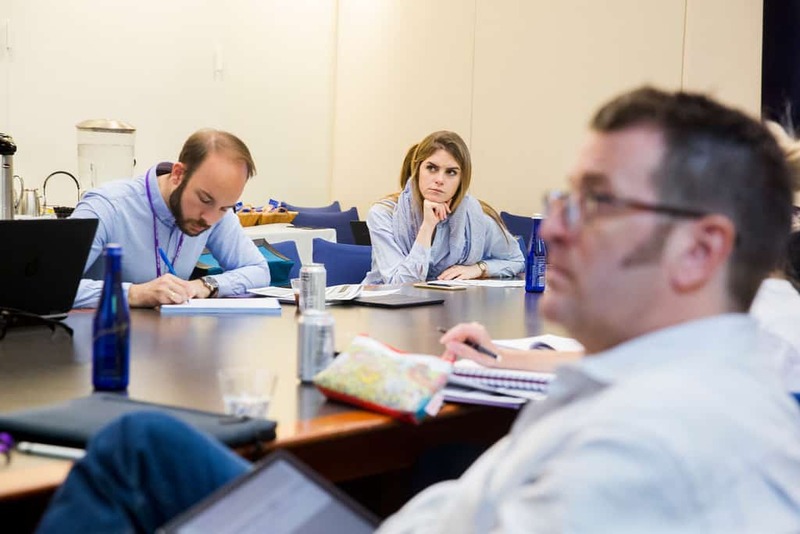 The program includes a one-week Global Experience module on US Corporate Law & Governance Program at New York University School of Law campus in New York City. 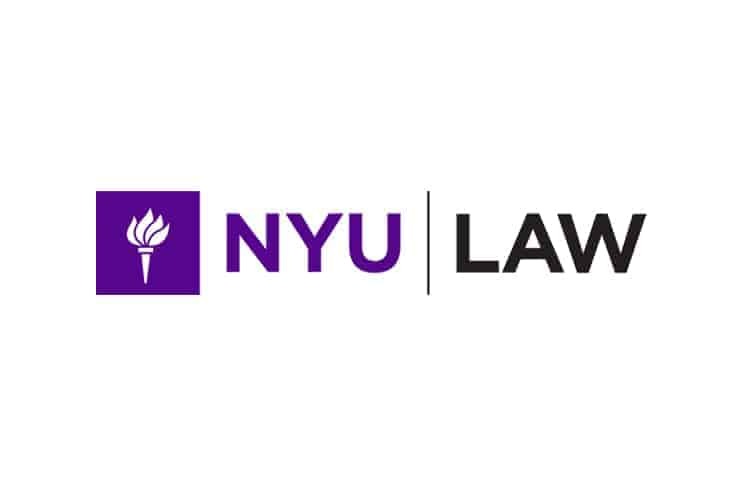 Upon completion, students will receive a certificate from NYU School of Law. Why Compliance is the next big thing? 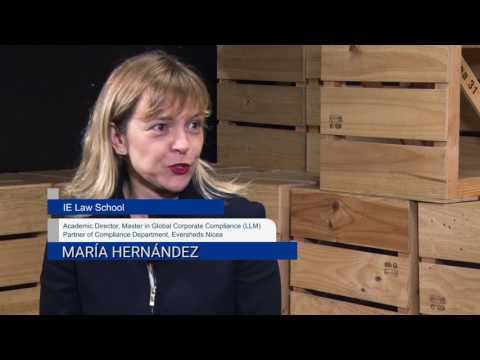 Dean Javier de Cendra and María Hernandez, Director of the Master in Global Corporate Compliance at IE Law School, discuss why Compliance is such a hot topic today. 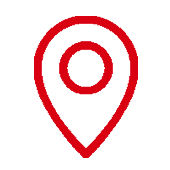 In today’s global corporate world respecting legal norms, as well as values and ethics of a company, is both the number one priority and challenge for banks in both the US and Europe. IE Law School invites you to take the next step to become a leader in the practice of Compliance with our new Master in Global Corporate Compliance in collaboration with NYU School of Law. This Module provides understanding of the macro-juridical framework under which corporations operate, with special focus on the main legislative bodies (Anglosaxon, EU, China and Islamic) and the most important institutions/ government bodies in each. This module will put students into perspective to start realizing the framework in which multinational corporations need to place themselves before engaging in business or while developing their operations at global level. It will be particularly useful for students without a legal background and will set the basics for all students to build up their international knowledge. In this module, students will have the opportunity to learn how companies are building cultures based on values and how this can make a difference. • Equip the student with the main tools for understanding the drivers for this greater scrutiny and expectations on corporate behavior. • Learn how to develop a robust CSR strategy (policies, management systems, reporting schemes, social responsible investment, etc.). • Understand how to analyze the connection with governance and integrity. • Navigate through the most relevant business cases in this topic. This module provides students with a framework to identify, assess, treat and report on risks and opportunities in the strategic planning of global companies. It covers accepted frameworks and techniques to manage business risks and exploit opportunities. After completing the course students will be able to make better decisions in the increasingly uncertain business environment. Furthermore, it develops processes to create and implement Internal Control Strategic Plans and forensic investigations. • Determining the Corporation "Risk Appetite"
Once the Risks Assessment has been conducted, the Company needs to identify the control measures required to prevent, mitigate or eradicate those risks. The student will learn to implement a Code of Conduct, draft specific policies and financial control measures and to design an effective Program to screen, monitor and contract Third Parties to detect potential legal and reputational risks. In this module, students will learn how to design and implement an effective training and communication strategic plan to ensure all employees and third parties are aware of the requirements and procedures set in the Corporate Compliance Program. We will also dive into the latest methodologies to ensure full compliance awareness: e-learning, gamification, storytelling, compliance comic communication, real life scenarios. Students will explore the Compliance function from different angles. First, they will explore the different structures that a Compliance function may adopt. Second, they will analyze the client- attorney privilege and its enforcement across jurisdictions, and finally, they will immerse in the day-to-day role of a compliance officer, exploring new technologies available to help them in their operational duties as well as in their reporting to the Board of Directors. An effective Compliance Program must be subject to on-going monitoring and periodic auditing to ensure its suitability and operational effectiveness. In this course we will explore monitoring methodologies to measure the effectiveness of the implanted controls and discovery of gaps in the control structure. Special attention will be given to ensuring the corporation keeps evidence of compliance with the Compliance Program and its established control mechanisms. The module focuses on the study of compliance in the fields of corruption, money laundering, environmental compliance, international trade compliance, antitrust and completion law, and finally, the impact of Compliance in data privacy and cybercrime. The course focuses on a comprehensive study of Foreign Corrupt Practice Act (USA), Role of SEC and DoJ on corruption related matters, UK Bribery Act, Role of UK Serious Fraud Office, International efforts to fight corruption (OECD, UN Compact), Effective Corruption Policies & Procedures, Conflict of Interest and Investigations, all through real case scenarios. • AML & CTF: Introduction and differences. • Financial Action Task Force. • AML Comparative laws analysis. • Main activities performed by AML & CTF corporate departments. • Financial Intelligence Unit: concept and main duties. • AML & CTF regulatory fines. • Building a good relationship with regulators, industry associations and colleagues. The course provides the fundamentals of Environmental Regulatory Compliance, such as definition & scope in corporate environment, programs (management, parameters), pre-processing, performing calculations and validating the data for compliance with any alert or reporting levels, environmental Compliance Audits, generation of compliance reports for authorities, and Environmental Data Management Systems. • Economic and financial sanctions: freezing of assets, embargoes, investment bans, etc. The course includes Data Privacy Regimes and principles in corporate environments as well as a glimpse of Social Media, the Internet of Things, and Big Data. Additionally, the cours will also focus on cybersecurity threats and control mechanisms in organizations together with international security cyber threats. The course includes Data Privacy Regimes and principles in corporate environments, a glimpse of Social Media, Internet of Things, and Big Data. Additionally it will also focus on cybersecurity threats and control mechanisms in organizations together with international security cyber threats. An exceptional compliance professional needs to understand how its clients’ business works, and the external forces that may affect it. Hence, this module focuses on enhancing student’s understanding on accounting, corporate strategy and economics. Special attention is paid to the tools necessary to create a culture of compliance within the business organization, and corporate governance. This course will emphasize the understanding of how financial statements are created and how accounting decisions affect these statements. The course will teach the theory emphasizing the use of accounting as a tool for decision-making and problem solving through the use of analytical, creative and critical thinking. This strategy course will introduce students to the mission and realities of general management in order to enable them to think strategically and effectively manage companies and business units. The course seeks to provide understanding of the corporations’ internal structure and functioning, the impact of corporate structures in the Compliance function, and the interaction of the Compliance Function with other key departments in the organization. The course focuses on the roles of directors and shareholders, the division of power between Board and General Meeting, Committees,fiduciary duties, D&O liability, and the OECD Principles of Corporate Governance. This course is imparted by IE with collaboration of NYU faculty, and is included on the US Corporate Law & Governance Certificate granted by NYU. • Tone at the Top - successfully engaging the Board and upper management. • Tone at the Middle - successfully engaging the middle management in the compliance efforts. • Compliance Ambassadors across the organization. • Measuring the Culture of Compliance in the organization. The course will cover the most important economic theories and concepts that relate to the macroeconomic and microeconomic environment of businesses. Students will comprehend the concepts and tools of economic analysis, gain a formal vision of how different economic policies operate and will assess the implications of different economic contexts and policies on the welfare of individuals, firms and the government. To be an integral professional, it demands the acquisition of knowledge and experiences beyond the formal legal arena. As such IE offers students tools to develop the interpersonal skills necessary to succeed in interviews, together with team building opportunities, lectures on current and groundbreaking fields, and international networking experiences beyond the classroom. A series of sessions imparted by the Careers’ Department that seek to provide basic tools on CV building and interviews’ processes to students, in order to maximize their success when attending job interviews. The LAUNCH period consists on a number of introductory classes designed to immerse students in the case methodology and to enhance their collaborative and team spirit. This series of sessions, carried by renowned professionals dealing with current topics in the areas of Corporate Law, Leadership skills, Compliance, Technology and Entrepreneurship, among others, provides updated knowledge to students, shaping them into well-rounded professionals. Compliance professionals need a set of strong interpersonally skills to succeed in their positions (persuasion, negotiation skills, communication, cultural awareness) and this course will assure our students master interpersonal skills. Students will attend a series of interactive sessions on Compliance hot topics given by the most varied and renowned professionals on the field. In this course, where we "flip the class to its utmost", students will team up to solve a complex practical case that will test all the tools learnt throughout the program. 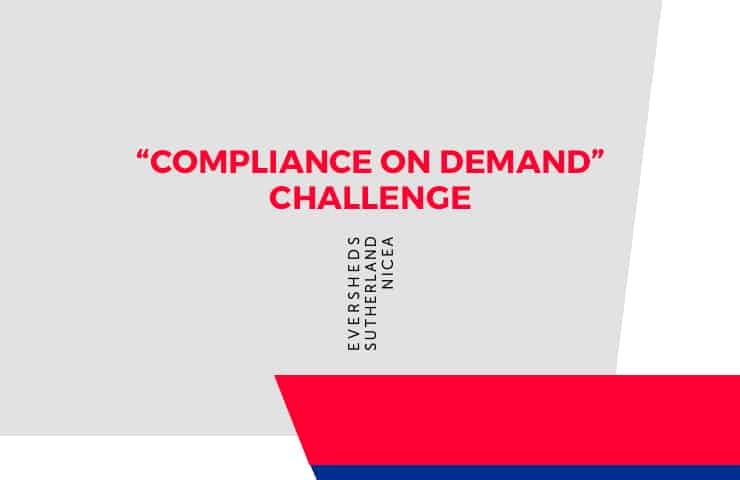 One or several students from the winning team will be granted an internship to work on the compliance department of Eversheds Nicea Madrid office. The purpose of this module is to give IE students a foundational set of hands-on skills that will allow them to work with data, which will give our students an advantage in the job market. The module will include topics like data management, data analytics and data visualization. The purpose of this module is to give our students an awareness of new and emerging technologies and the ability to visualize how these technologies might be applied to their specific field. This course will give them an innovative edge consistent with our corporate values of innovation and entrepreneurship.